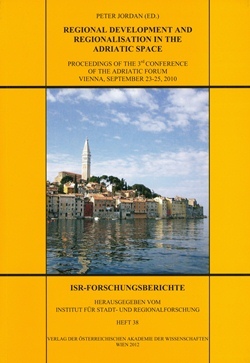 The 3rd Conference of the Adriatic Forum took place September 23-25, 2010, in Vienna and was devoted to the general theme Regional Development and Regionalisation which corresponds to global and European challenges as well as to demands for research in the wider Adriatic region. These proceedings comprise just a smaller selection of papers presented at the conference, i.e. the papers closest to the conference theme in regional and thematic terms. They start with transnational views followed by focuses on individual countries in the Adriatic space. While Milan BUFON (Koper/Capodistria) and Damir JOSIPOVIC (Ljubljana) present surveys over the development of trans-border relations and ethno-demographic situations, resp., in the wider region of the Upper Adriatic, Maria Paola PAGNINI (Rome) and André SANGUIN (Paris) draw a comparison between the development of border regions in the Southern Alps and the Pyrenees. Peter JORDAN (Vienna) closes this transnational part by an analysis of administrative decentralisation processes in all Adriatic countries. Contributions on individual countries start with Slovenia, of which Lucka LORBER (Maribor) discusses the development of spatial disparities in recent decades followed by Anton GOSAR (Koper/Capodistria), who presents the various attempts of regionalising Slovenia for purposes of tourism branding. Simon KERMA (Koper/Capodistria) then plunges into the Slovenian coastal region Primorska, when he describes efforts to promote wine tourism. Jelena LONCAR and Zoran STIPERSKI (both Zagreb) deal with a Croatian topic, when they highlight the relative socio-economic role and development of Central Croatia within the country. Jan WENDT (Gdansk) throws finally a glance on Polish tourism to Croatia and Slovenia.